← Royal Hospital, Chelsea. Photo & text: John Londei. St. Pancras. Photo: Tim Marshall, text John Betjeman. Posted: November 9, 2011 | Author: thelondoncolumn | Filed under: Architectural, Literary London, Transport | Tags: Edward Mirzoeff, John Betjeman, St. Pancras |Comments Off on St. Pancras. Photo: Tim Marshall, text John Betjeman. “For the last ninety years almost, Sir Gilbert Scott has had a bad Press. He is condemned as facile, smart, aggressive, complacent and commercial.When at the top of his form Scott was as good as the best of his Gothic contemporaries. He was so firm a believer in the Gothic style as the only true ‘Christian’ style – Scott was a moderate High Churchman – that he was determined to adapt it for domestic and commercial purposes. 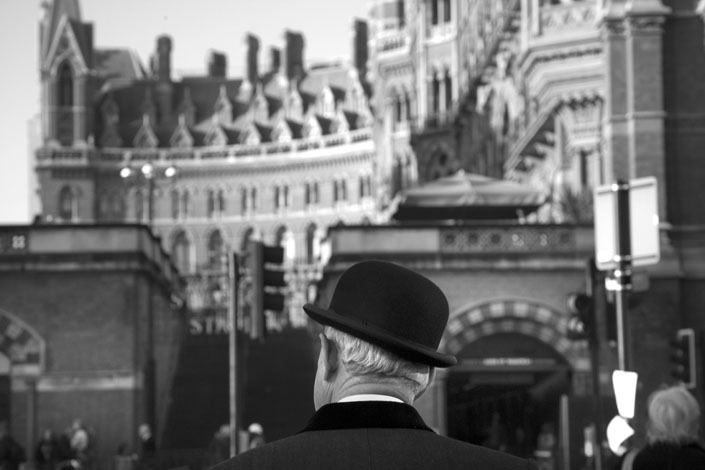 St. Pancras Station hotel was his greatest chance in London and well he rose to the occasion. Not long after this book was published I approached British Railways proposing a BBC documentary on London stations, with Betjeman. BR insisted on charging a facility fee at the same daily rate as that for feature films – which killed the idea, doubtless as intended.